Deep beneath Alaska’s Aleutian Islands, down where the pressure and temperatures have become so high that rock starts to flow, new continental crust is being born. Scientists have long believed that continental crust forms in volcanic arcs – they know the magma brought up in the arcs’ volcanoes is geochemically very similar to continental crust. The lingering question has been how exactly that happens. While the magma that reaches the surface is similar to continental crust, the lower crust beneath volcanic arcs is quite different from the lower half of continental crust. A new study appearing in this week’s Nature Geoscience raises questions about one popular theory and provides new support for another, in which arc lava from the surface and shallow “plutons” – magma that solidified without erupting – are pulled down into the Earth at subduction zones and then rise up to accumulate at the bottom of the arc crust like steam on a kitchen ceiling. Scientists have found compelling evidence to suggest that this could have produced the vast majority of lower continental crust through Earth history. The process, called relamination, starts at the edge of a continental plate, where an oceanic plate is diving under the continental plate and magma is rising to form a volcanic arc. As the oceanic plate dives, it drags down sediment, lava and plutonic rock from the edge of the arc. As arc material descends, minerals within it become unstable with the rising pressure and heat, and they undergo chemical changes. New minerals form, and chunks of the rock and sediment can break off. When those chunks are denser than the mantle rock around them, they continue to sink. But when they are less dense, such as those that form silica-rich granulites, they become buoyant and float upward until they reach the bottom of the arc crust and accumulate there. “Sediments are really well represented in continental lower crust, but how did they get on to the bottom of the continent? The easiest way is for that sediment to be pushed down a subduction zone and rise to accumulate at the base of the crust,” said Peter Kelemen, a geochemist at Columbia University’s Lamont-Doherty Earth Observatory and author of the paper with Mark Behn of Woods Hole Oceanographic Institution. To determine how arc crust could turn into continental crust, Kelemen and Behn examined the only two known sites where a complete section of arc lower crust is visible on land. One site, in Pakistan, had been caught in the ancient collision of tectonic plates between India and Asia, and was thrust up into steep mountains. The other, the Talkeetna arc stretching from the Alaska Peninsula to Valdez, was pushed up at the edge of North America. “We don’t usually get to see the bottoms of arc lower crust, but in Alaska and Pakistan we can see right down to the bottom. These old arcs formed, crashed into North America, turned on their sides, and were eroded over millions of years. Because they’re tilted, we can walk right down from the seafloor, past the base of the crust and into the mantle,” Kelemen said. Along the length of these areas of exposed arc crust, the scientists took samples to see how the geochemical composition of the rock changed with increasing depth in the crust. They were able to extract minerals that had recorded the pressure and temperature at the point where the minerals crystalized deep underground, marking how deep the rock was at each point. The scientists found significant changes in the crustal composition about half way down into the arc crust. In the lower half of the arc crust, starting about 20 kilometers below the original surface, the average concentration of “incompatible” trace elements – elements like tantalum and potassium that prefer to remain in melt during crystallization – was much less than in lower continental crust at the same depth. It was only the upper 20 kilometers of the arc crust that had compositions similar to lower continental crust. That becomes a problem for one leading theory of how continental crust forms, Kelemen said. 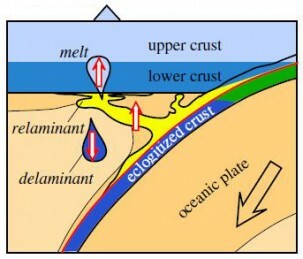 That theory suggests that the arc crust delaminates – dense bits of rock within the arc crust slowly move downward and “founder” into the mantle until the arc crust attains the composition of continental crust. 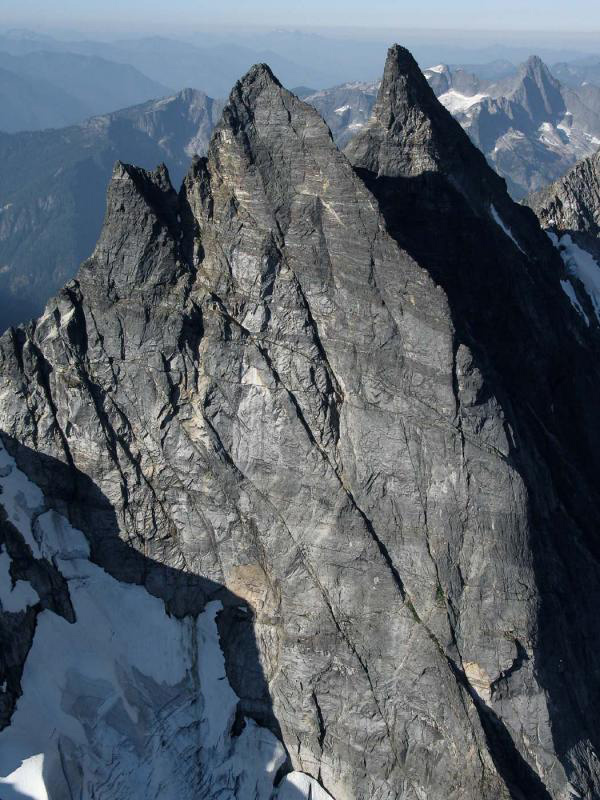 The new data suggests that for delamination to work would require removing much of the rock from a 20-kilometer thickness of crust. However, delamination only works below 35 to 40 km depth. “So, even after we remove a bit of dense stuff off the bottom, you’re still going to end up with lower crust in the arcs that looks really different from lower crust in the continents. The process isn’t sufficient to make continental lower crust out of arc crust,” Kelemen said. Delamination does take place, but for it to be the driving force would require a complex process of repeated crustal thickening and metamorphic events, he said. Kelemen and Behn suggest a simpler process. The authors put their model to the test on the Aleutian Islands. In that volcanic arc, the lava and plutons are similar to continental crust, but the lower crust is highly depleted in elements that are abundant in lower continental crust. To determine the potential for relamination to produce lower continental crust, the scientists calculated the density of the exposed lava and plutons at subduction zone pressures and temperatures. About 44 percent of the Aleutian lavas and 78 percent of the plutons would be more buoyant than mantle peridotite under subduction zone conditions, they found. This suggests that if parts of the Aleutian arc are pulled down into the subduction zone, at a depth of 90 to 120 km, where temperatures exceed 700°C, the arc lavas and plutons would rise to accumulate along the bottom of the crust. The composition of this accumulated material would look like lower continental crust. Intrigued by that finding, the scientists performed the same calculations for other arcs. They found that at the Alaska Talkeetna site, 48 percent of lavas and 37 percent of plutons would be buoyant. At Kohistan, the site in Pakistan, 36 percent of lavas and 29 percent of plutons would be buoyant. Relamination may be evident in Southern California’s Pelona Schist where sections of lower continental crust are visible, Kelemen said. Clay rocks and blobs of mantle peridotite surrounded by more buoyant materials can be found in the exposed, “underplated” crust. “We can see young, volcanic sediments that were stuffed under older continental crust and are now part of the overall package. How did they get down there? It happened in Southern California, and I would argue it probably happens in a lot of places,” Kelemen said.